OUR BUS GATHERED 30 OF US TO A NEARBY DOCK. The floating Islands of Uros are one of the main attractions on Lake Titicaca. There are literally hundreds of these man made islands, each constructed and inhabited by Aymara-speaking indigenous people. They began weaving reeds into islands in an effort to isolate themselves from other aggressive tribes. Tours usually pass by these islands on their way to Taquile and Amantani Islands. The island that we visited is a bit further away from Puno. Daytrip tours tend to go to islands nearer to the coast, but this island only gets group of visitors 4-5 times per year. The floating islanders show off their reed-weaving skills and with just a few Pesos, you can ride their canoe-like raft around the lake. Local women and children wear colorful costumes, taking pictures with us. AFTER LEAVING THE UROS ISLANDS, our ferry stopped suddenly in the middle of the lake. Luckily it wasn’t a Titanic scale emergency. One of the engines weren’t working well and our captain decided to change ferries before it went into a full blown disaster. As a result, we waited and switched into another boat before going onwards to Isla Amantani. Isla Amantani is one of the more isolated islands on Lake Titicaca. Upon arrival, we were split into groups of 3 or 4, and each groups were led to their respective homestay families. Me, soul-searching Emma from US, Elva and Jesus, a couple from Lima, were grouped together. We stayed with Wilma and her father Estaban. The accommodation is a simple yet clean room in their house. We were served quinoa soup, fried cheese and boiled potatoes for lunch. The local people here are typically farmers. 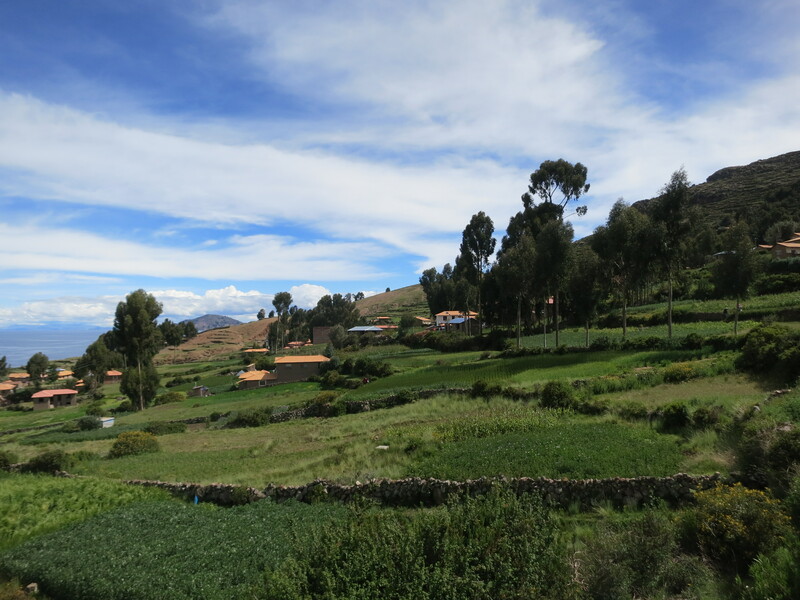 They speak Quechua and they love their quinoa very much. There are two trails leading to either Panchatata (Father) or Panchamama (Mother) hills. After choosing one, we hiked up for a spectacular view of the coast and the entire island. It is a truly relaxing spot. Watching the sunset on the hilltop is almost a meditative experience. AT NIGHT, everyone in the village gathered at a common area. Beers were served and the local band played music for us to dance. The village ladies were friendly but they looked so tired. The Lake Titicaca being one of the highest lake in the world, dancing is such an aerobic feat. We danced, partied and gazed at the stars. The lake is indeed a magical place, and I look forward to the adventures ahead. Wilma is a very good cook!